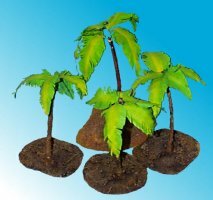 Here I describe how to make those cute little palm trees you need for Gorka Morka or a Kemrih oasis. What glue can you use? I would propose CA-glue (cyan acrylat) for the leafes. Please make sure that you don't glue your fingers or any other body parts together. For everything else PVA-glue will do. You can obtain all this from Games Workshop or any home improvement mart. You will need some paper, green paper would be the best. You need thin and thick wire, glue and some paint. For the base you need thick cardboard and some sand. We will make the leafes out of paper with a piece of wire. So you will need a piece of green paper (painting one green will also do). Then fold it many times and cut out a leaf. Because you folded the paper, you now should have ten to twenty leafes. Now glue them to a thin piece of wire. You can use clothespins to hold the wire while the glue is drying. For better leafes paint the paper afterwards. Water colour is good for this. Just paint a dark green line in the middle of the leaf. Then paint the borders with yellow. To get a ragged leaf, make a series of cuts from the border. At last bend the leaf a little bit to get a slightly hanging leaf. Now cut a piece from the thick wire and connect (glue) it to the base. Then connect three to five leafes to the top of the tree. To make a realistic bark you need a long strip of paper which you wind around the tree (overlapping). Paint it brown. For a realistic desert base glue some sand to the base. Paint it with a sand color like Bleached Bone and drybrush it with white. Your palm tree is finished. They look best, if you build a small oasis with four or five of them.